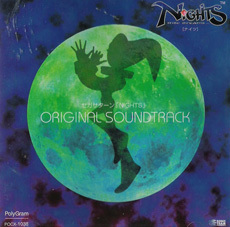 The NiGHTS into Dreams 'Original Soundtrack' was released under the PolyGram label on 7.10.1996. Credits to Tomoko Sasaki, Naofumi Hataya, Fumie Kumatani. Catalogue No# POCX-1038. It contains a lovely 14 page (16 including the cover) full color glossy booklet (in full Japanese) which alone is worth buying a hardcopy for. Rare. Mint copies are hard to come by and come with a protective slip and an Obi spine card. This CD can go for over £100 on Ebay. (*) indicates a new track that wasn't playable on the original game CD.